Nearly one-hundred years after the Civil War, African Americans still faced social segregation and second-class citizenship. They lived in a world that was both separate and unequal. 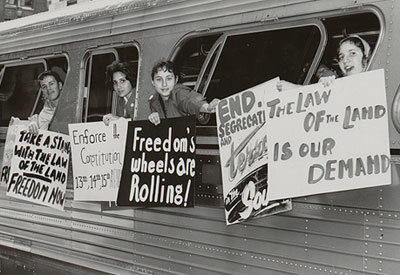 The Civil Rights movement of the 1950s and 1960s sought integration and equal treatment for Black people in American life. Civil rights activists used nonviolent protest and civil disobedience to bring attention to their cause; their efforts resulted in federal laws that protected the rights of African Americans to participate in the social and political life of the country. This time in U.S. history was marked by the Civil Rights Movement and the country’s involvement in the Vietnam War. The tense political climate of the day was fueled by frustration from civil rights groups and individuals tired of being ignored and treated unfairly and unequally. In particular, civil rights groups were angered at the continued practice of segregation of public facilities including schools, parks, water fountains, transportation, and more. The false notion of “separate but equal” was unacceptable. While Black slaves had been emancipated and African American women and men had gained the right to vote decades before, they still struggled to secure federal protections for these rights. Furthermore, the Vietnam War resulted in the draft being reinstated which primarily targeted poor, working-class men--another form of inequality. These continued injustices set the stage for new and more powerful modes of social justice movement, including the increasing use of nonviolent protests, marches, and civil disobedience.